Nine Practices of the Successful Security Leader lays out a series of best practices for security managers. Collected from interviews with security leaders at public and private sector organizations, ranging from small- and mid-size all the way up to large international entities, these practices are a sampling of what is vital and what works. Recommendations such as close communication with management, alignment of security agendas with business goals, and creating internal awareness programs are just some of the effective initiatives detailed in the report. With this information, security professionals can gain insight into the practices of their peers, measure their own success, and mentor junior colleagues. 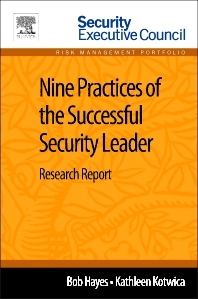 Nine Practices of the Successful Security Leader is a part of Elsevier’s Security Executive Council Risk Management Portfolio, a collection of real world solutions and "how-to" guidelines that equip executives, practitioners, and educators with proven information for successful security and risk management programs.